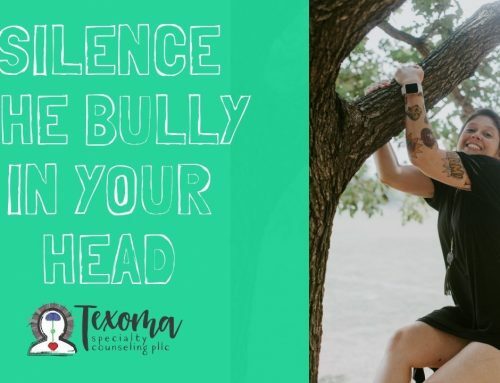 As an Eating Disorder Therapist in Sherman, TX I give clients tips for how to manage the urge to purge. In my private practice I see clients struggling with Bulimia. Bulimia is a type of eating disorder associated with episodes of bingeing and purging. Purging is a compensatory behavior to rid the body of calories consumed. Purging comes in many different forms. 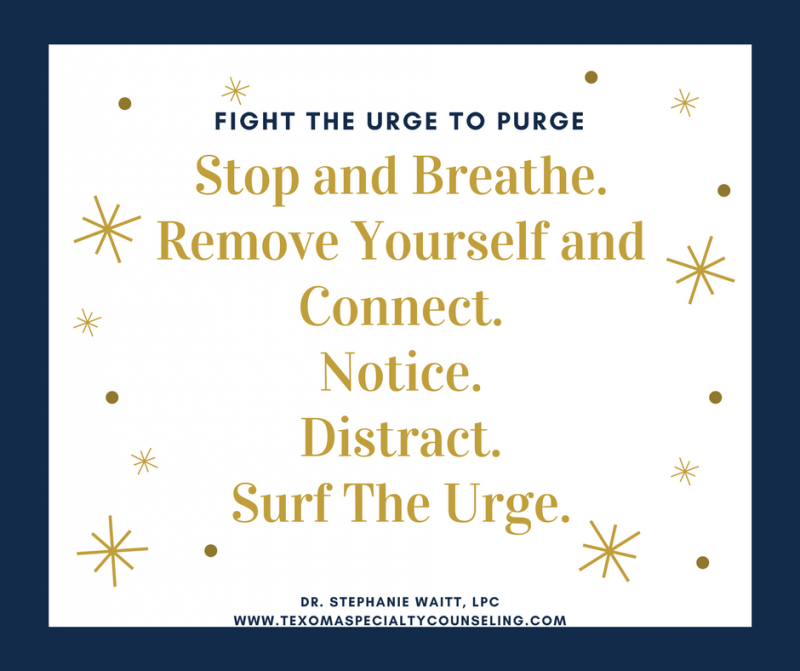 Below I give some tips for how to manage the urge to purge. But first let’s look at what it might look like to live with bulimia. You wake up and immediately feel anxious about your day. You are embarrassed that last night you missed your sorority party because you were too ashamed from bingeing earlier in the day. You feel awkward and weird. You do not like what you see in the mirror. You feel uncomfortable in your body. You are consumed with how uncomfortable you feel in your body. You are so preoccupied with thoughts about your body that you miss what your professor said about the test tomorrow. You go to the next class and feel exhausted. You start thinking about the food in your dorm room. You start picturing the food in the cafe. You become preoccupied with thoughts about food. You just want to eat something. However you fear that eating will change your body. You eat and when you start to eat you feel out of control. You feel unable to stop eating and although you are disgusted and ashamed of yourself you feel you cannot stop. But you also notice that you are no longer thinking about all the stuff that upsets you. You are no longer worried about your classes, your roommate and her drama, the test you have tomorrow, and the fight you had with your mom earlier. All that stress, anxiety, sadness, and fear seem to go away. But now you are consumed with thoughts about your body. You are filled with shame and guilt about what you just ate. The urge to purge comes on strong. It is an intense wave of panic, excitement, and adrenaline. You know that purging will make you feel better, but only for just a moment. Afterward you know you feel ashamed, disgusted, and depressed. However the urge becomes so strong you feel like you are going to crawl out of your skin if you do not do something. You get up to do whatever you need to do purge. 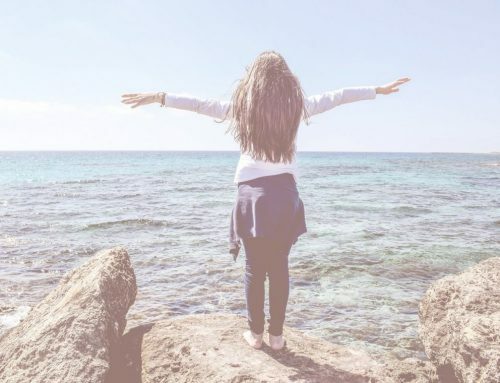 In this moment, this very intense moment, it is possible to regain control over your body and stop the eating disorder from winning. Here is what I teach my client’s to manage the urge to purge. Before you purge take a moment and stop yourself. Literally picture a big, red stop sign in your mind. Now take a deep breath or two in and out. As you breathe in count to 3, hold the breath in your lungs for just a moment, then breathe out. Now that you have stopped for just a second and have taken a couple deep breaths remove yourself from the place where you binged and/or purge. If you are in the bathroom, go stand in the hallway. If you are in your dorm room, open the door. The idea here is to not be isolated. If you are in your house, go into the living area. Call or text a friend. Your bulimia wants you to be alone, but connecting with someone will help you fight the urge to purge. Decrease isolation and engage with a loving and supportive friend or family member. Observe your environment and notice your emotions. Use all your senses to help bring your awareness to your environment, your emotions, and your situation. Use this observation to identify your emotions. You are wanting to purge because you are experiencing negative emotions, NOT because of the food you ate. Shop On Amazon (you can add things to your cart but never purchase them). Work On A DIY Project. The urge to purge will pass. Urges are like the waves in the ocean, they come and go. They can be large and overbearing, but eventually the wave will crest and die down. This will happen with your urge. It will build but will go away. The goal with this skill is to put enough time and distance between the urge and the behavior so that the urge will pass without having to engage in the behavior. This will not be easy to do in the moment, so it is best to be prepared beforehand. Write these tips down, print this post out and keep it where you can easily get to it when you feel the urge building or when you are starting to notice an increase in negative emotions. If you are dealing with Bulimia it is important that you seek support and help. You can 100% recover from Bulimia, I see it every day in my practice, and you can make the BIG first step by reaching out for help. Not sure who to ask for help? Contact me and I can help you find the help and support you deserve.